According to the latest market report published by Transparency Market Research titled “Medical Device Labeling Market: Global Industry Analysis, Size, Share, Growth, Trends and Forecast, 2017–2025,” global revenues generated from sales of disposable consumables were around US$ 716.4 Mn in 2017, and are projected to increase at a CAGR of 6.3% during forecast period 2017-2025. Disposable consumables segment is anticipated to be the highest contributor to the global medical device labeling market, over the forecast period, 2017-2025. The global medical device labeling market has witnessed impressive growth over the past few decades, due to stringent FDA regulations and introduction of new medical devices in the market. Growing awareness regarding FDA standards helps in the growth of the medical device labeling market. Labeling helps to ensure the effectiveness and safety of a device. With the help of centralized labeling, the companies are empowered to rapidly shift labeling from one facility to another to continue support operations. Rising number of new medical devices and drug discoveries are some of the prominent factors which lead to an increase in the demand of medical device labeling. On the basis of label type, pressure sensitive labels segment accounts for the largest market share of medical device labeling market of because of growth in the technological advancements to overcome the existing challenges. On the basis of application of medical device labeling market, disposable consumables segment is expected to dominate the market during the forecast period. On the basis of material type, paper segment dominates the market of global medical device labeling market. North America is estimated to account for the largest share in medical device labeling market due to high investment on research and development in the medical sector in this region. North America is expected to trail APAC in medical device labeling market. 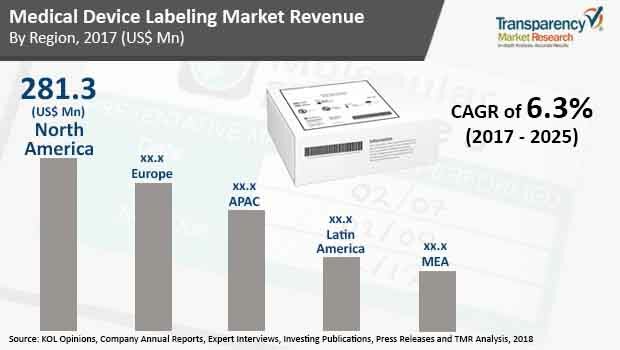 MEA is estimated to contribute a small but rapidly growing market share in medical device labeling market. Latin America is however slated for moderate growth over the forecast period. The market players that have been profiled in the rpeort include - 3M Company, Amcor Limited, Mondi Group Plc, Avery Dennison Corporation, Lintec Corporation, Huhtamaki Oyj, UPM Raflatac, CCL Industries Inc, Schreiner Group GmbH & Co. KG, Denny Bros Ltd., WS Packaging Group, Inc, Resource Label Group LLC, Faubel & Co.Nachf. GmbH, Tapecon Inc., Weber Packaging Solutions, Inc., JH Bertrand Inc., Coast Label Company, and Label Source. The report analyzes key drivers and restraints, as well as the medical device labeling market trends, and performs impact analysis based on the average weighted model.